Cabin IC - New fire in the ENF near leaf springs lookout, Lot's of Cal Fire Units including dozer's heading to the El Dorado National forest area. 09/30/08-1630 Rock Fire, CA-PNF 20 acres crews are making progress with the fireline construction. The fire is near Rock Creek powerhouse along Hwy 70 currently 3 to 5 acres with a moderate rate of spread. 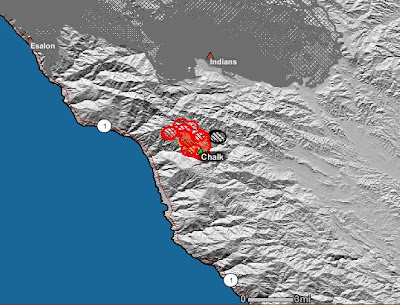 09/30-1815 Chalk (CA-LPF-2754) has burned 3,453 acres and is 8% contained. The acreage increase is over a 24 hour burn period. Accurate data was not available at earlier. The incident will be in Unified Command with Fort Hunter Liggett tomorrow morning at 0600 hours. 09/30-1800 Tehipite (CA-KNP-0020) This monitor/confine/contain wildland fire has burned 11,085 acres. the main fire spread will be to the west. Some movement will continue on the southeast towards the northeast. All other areas of the perimeter show little or no movement. 09/30-1800 Hidden (CA-KNP-0035) is 100% contained at 3,668 acres. Ground resources continued to mop-up and patrol the containment lines. rehabilitation of the control lines has begun and will continue for the next 6 to 7 days. A transfer of command from the Boise NIMO team to the local forests occurred today at 0600 hrs. On the Blue 2/Siskiyou fire, crews continue to suppress a 150 acre slopover near Chimney Rock. 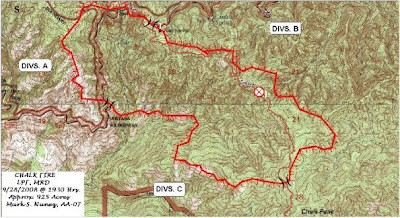 Assessment is being made for additional suppression action on Harrington's Ridge and the Dillon Divide area of the Siskiyou Fire. The North Ukonom, South Ukonom, Panther, Anthony Milne, and Caribou fires was transferred to the Klamath National Forest. On the Panther fire, infrared imagery detected several spot fires in the areas of Blue Granite, Burney, and Deadman Lakes. On the South Ukonom fire, crews suppressed a small slopover in Little North Fork Creek. On the Blue 2/Siskiyou fire, crews continue to suppress a 150 acre slopover near Chimney Rock. Assessment is being made for additional suppression action on Harrington's Ridge and the Dillon Divide area of the Siskiyou Fire. The Marble Mountain Repair Group finished repair activities in the Marble Mountain Wilderness. 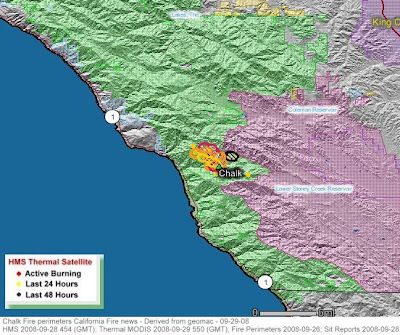 Update: 09/30-1815 Chalk (CA-LPF-2754) has burned 3,453 acres and is 8% contained. The acreage increase is over a 24 hour burn period. Accurate data was not available at earlier. The incident will be in Unified Command with Fort Hunter Liggett tomorrow morning at 0600 hours. Update: 08-30-08 - 08:30 hrs - 1100 personnel - Fire is expected to move south during next 12 hours, Advisory evacuations in Dempsey Flat area, and Beiar Property. Fuels: Large volume of dead and down material in the fire fuel bed of Oak woodland and pockets of timber. There is no prior recorded fire history in this area. Evacuations: Update: 08-30-08 - 08:30 hrs - People are advised to evacuate the Dempsey Flat area and the Beiar Property. The Monterey County Sheriff issued Mandatory Evacuation Order for the immediate fire area south of Chalk Peak and South Coast Ridge Road. Approximately 7 homes, 1 commercial property and 4 outbuildings are within the evacuation area. An Evacuation Advisory is in place for the Lucia, Mill Creek, Hare Creek and Limeklin State Park. The advisory warns residents to be prepared to evacuate should an order be issued. (CA-LPF-2754) is 5% contained after burning 1,708 acres. People are advised to evacuate the Dempsey Flat area and the Beiar Property. There is a large volume of dead and down material in the fire fuel bed of Oak woodland and pockets of timber. There is no prior recorded fire history in this area. (CA-LPF-2754) has burned 1,708 acres and is 5% contained. There is potential for fire spread in all directions with frequent spotting up to a 1/8 mile. Access to the fire is a concern with steep rugged terrain. The fire is burning in the Ventana Wilderness and evacuation orders are in place. Rollout significantly contributes to downhill spread. (CA-LPF-2754), The fire continued to be very active last night with spotting and intense uphill runs on the northeast side. Crews worked through the night constructing control lines. The fire has a high potential to move extremely quickly and erratically and the terrain is very steep. Today crews will continue to construct hand line to keep the fire north of Prewitt Ridge, west of Del Venturi Road, south of the San Vicente Trail to San Antonio Trail and east of Highway 1. Crews will be supported by helicopters and air tankers. Highway, Road and Area Closures: Nacimiento-Fergusson Road and South Coast Ridge Road are closed. Highway 1 is open. RED FLAG WARNING: IS IN EFFECT FROM 2 PM THIS AFTERNOON TO 11 PM PDT THIS EVENING FOR SCATTERED THUNDERSTORMS WITH INSUFFICIENT MOISTURE IN ZONES 624 284 AND 285. UNSTABLE CONDITIONS AND INCREASED MOISTURE FROM THE SOUTH WILL RESULT IN SCATTERED AND MOSTLY DRY THUNDERSTORM ACTIVITY THROUGH THE AFTERNOON AND EVENING. PRECIPITATION AMOUNTS WITH SHOWERS AND STORMS TODAY WILL BE LIGHT...GENERALLY LESS THAN A TENTH OF AN INCH. SHOWERS AND STORMS WILL ALSO PRODUCE INCREASED AND GUSTY SOUTH WINDS. A RED FLAG WARNING MEANS THAT CRITICAL FIRE WEATHER CONDITIONS ARE EITHER OCCURRING NOW...OR WILL SHORTLY. A COMBINATION OF LIGHTNING AND DRY FUELS WILL POSE A SIGNIFICANT THREAT FOR NEW STARTS. Wildland fire activity remains light nationally. Oregon and California currently have six large fires combined. A team is assisting the Texas Forest Service with Hurricane Ike recovery operations in Houston, Texas. NEW Chalk (Los Padres National Forest): 925 acres at five percent contained. This fire is located nine miles north of Gorda. Structures were evacuated and road closures are in effect. Hidden (Sequoia and Kings Canyon National Park): 3,637 acres at 96 percent contained. Moderate fire activity was reported. Information: Call (559) 565-3703 or visit the web site. Wizard (Deschutes National Forest): 500 acres at 10 percent contained. This fire is 18 miles northwest of Sisters. Kitson (Willamette National Forest): 1,000 acres at 40 percent contained. This fire is seven miles southeast of Oakridge. Gnarl Ridge (Mt Hood National Forest): 3,280 acres at 65 percent contained. This previously reported incident is 10 miles south of Parkdale. Structures are threatened. Information: Call (541) 352-6002 ext. 628 or visit the web site. Lonesome Complex (Rogue River National Forest): 19,748 acres at 42 percent contained. This complex of three fires is 20 miles northeast of Prospect. Historical structures are threatened. Information: Visit the web site. Cal Fire was one of five California groups to win national recognition for outstanding achievement and leadership for technology projects and large project management. The National Association of Chief Information Officers sponsored the contest. There were more than 114 submissions to this year's competition in 10 categories by 30 states. Cal Fire won for its computer-aided dispatch system. "Often, the first contact the public has in an emergency is with our 911 command centers," said CAL FIRE Director Ruben Grijalva. "Through innovation and teamwork, our information technology staff has greatly enhanced CAL FIRE's ability to deliver life-saving emergency response with this computer aided dispatch system." NASCIO's Recognition Awards Program features categories reflecting the wide range of Information Technology projects currently under development within state governments. Emphasis was placed on recognizing programs that exemplify best practices, support the public policy goals of state leaders, represent an innovative use of existing technology or a use of new technology, assist government officials to efficiently execute their duties, provide cost-effective service to citizens and are transferable to other agencies or units of government. Editors thoughts: Looks to be going big...All the way out to highway 1? Evacuations - Evacuations were called for 3 parcels of private land within the national forest, in the area of Prewitt Ridge, Alms Ridge and Mill Creek for a total of 20 residences. It appears that most of the residents have chosen not to evacuate. As a precautionary measure, 3 National Forest Campgrounds southwest of the fire have been advised to evacuate. Other rural residences and private inholdings may need to be evacuated. Location: Los padres National forest - 22 miles west of King City / 2 miles east of Highway 1, Monterey Road both sides of Coast Ridge Trail south of Nacimiento Ferguson Road. Commander Jim Smith (USFS), of Central Coast Interagency Incident Management Team 7. The Incident Command Post is at Ft. Hunter Liggett. which will be taking command of the Chalk Fire. Fuels Involved: Oak and brush. Large volume of dead and down material in fire fuel bed. No prior recorded fire history in area of involvement. Fire Behavior: Short range crown fires observed. Spotting ahead of the fire up to 300 feet. Planed Actions: Continue to hold and burn out the South Coast Ridge Road. Burn out dozer line constructed from Highway 1 from Prewitt Ridge west to Highway 1. Engines: 36 - Charlie Strike teams: CNF, BEU, TNF, ANF-1610C, BDF-6609C. The Chalk Fire started at approximately 7:30 p.m Saturday, September 27 in the upper Mill Creek drainage area of Los Padres National Forest in Monterey County. The fire is about 22 miles southwest of King City and about 2 miles east of Highway 1. It is primarily south of Nacimiento Fergusson Road which connects Fort Hunter Liggett to Highway 1. The fire has burned approximately 800-900 acres in oak and brush in steep, rugged terrain. There is very little to no wind on the fire and it is primarily slope and fuel-driven. Earlier this afternoon the fire reached and crossed to the north side of Nacimiento Fergusson Road; it is also on both the west and east sides of South Coast Ridge Road. Residents of three parcels of private land within the national forest in the Prewitt Ridge, Alms Ridge and Mill Creek areas, were advised to evacuate earlier today. The fire is approximately 2 miles from the nearest home. 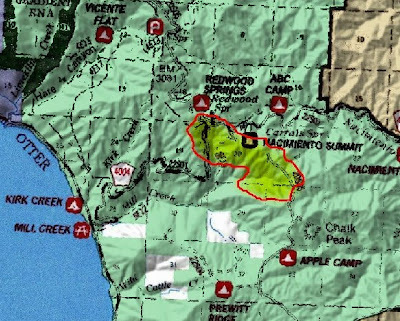 All National Forest campgrounds along the Nacimiento-Fergusson Road, South Coast Ridge Road and Prewitt Ridge, have been evacuated. An Evacuation Advisory has been issued for Highway 1 in the Limekiln, Mill Creek, Hermitage and Harlan Property areas. This advisory is a precautionary notice that people in these areas should be prepared to evacuate if an evacuation order is issued. Road closures: Nacimiento Fergusson Road is closed at Highway 1 on the west side and at the national forest boundary on the east side. South Coast Ridge Road is closed at Nacimiento Fergusson Road and Highway 1 at Plaskett Creek. More detailed information about the location and status of the fire and the resources assigned will be available after 7:30 a.m. Monday. Oak and brush. Large volume of dead and down material in fire fuel bed. No prior recorded fire history in area of involvement. Short range crown fires observed. Spotting ahead of the fire up to 300 feet. Evacuations were called for 3 parcels of private land within the national forest, in the area of Prewitt Ridge, Alms Ridge and Mill Creek for a total of 20 residences. It appears that most of the residents have chosen not to evacuate. Continue to hold and burn out the South Coast Ridge Road. Burn out dozer line constructed from Highway 1 from Prewitt Ridge west to Highway 1. The Chalk Fire started at approximately 7:30 p.m last evening and has now burned 500-600 acres. The fire is located just to the north of Chalk Peak, approximately 22 miles south west of King City, in the Monterey County section of Los Padre National Forest. The fire is burning in oak and brush west of Chalk Peak and South Coast Ridge Road and is on both sides of South Coast ridge Road. By 1:00 p.m. this afternoon, the fire had crossed Nacimiento Ferguson Road and is currently burning on both sides of the road. The fire is currently very visible, as it is generating a large column of smoke. Road closures: Nacimiento Ferguson Road is closed at Highway-1 on the west side and at the forest boundary on the east side. South Coast Ridge Road is closed at Nacimiento Ferguson Road and Highway-1 at Plaskett Creek. Evacuations: As a precautionary measure, 3 national forest campgrounds southwest of the fire have been advised to evacute. Other rural residences and private inholdings may need to be evacuated. Resources either on scene or ordered: 7 helicopters, 8 air tankers, 1 lead plane, 1 air attack aircraft and 10 engines. 22 miles south west of King City, Ca. Friday's operations along the northwest and western flanks strengthened the holding lines on the Hidden Fire. As the fuels that are adjacent to the line burnout and cool the possibility of spot fires will diminish. The fire is 94% contained and full containment is anticipated by September 30, 2008. The fire is visible from nearby communities including Three Rivers, Lemon Cove, and Badger. · Close windows, especially at night when air tends to settle. · Use the recirculation option in your car to prevent smoke from entering the vehicle. · Avoid prolonged exertion in heavy smoke especially if you are sensitive to smoke impact. In order to provide for public safety, Crystal Cave, the Crystal Cave Road, and the trail to the Muir Grove (trailhead located at Dorst Campground) remain closed until further notice. The Colony Mill Road has an advisory posted at the North Fork Drive trailhead advising that the road will be closed ahead because of fire danger. Closed timber litter and heavy mixed conifer. Fire behavior was low to moderate throughout the burn period. Slow backing fire was observed on the slopes with some small slope runs but overall a slow rate of spread. Significant progress has been obtained with the firing operation that will continue today on the interior of the fire perimeter, strengthening the lines. Continue with the firing operation. Extinguish all spot fires, mop-up, and patrol containment lines. The current infrared scan indicates that the actual burned acres are at 3,492. Once the interior of the fire area fully burns out remaining fuel inside the lines, the final acreage should come close to 3,700 acres. To date, there is still quite a bit of unburned fuel within the containment lines. Hence, the change in reported acreage. Interior fuel islands will continue to burn allowing the acreage increase today. Increases in relative humidity, higher fuel moisture and a general improvement in predicted fire weather conditions have caused Cal Fire to lift a suspension on burning under permit and other open uses of fire in San Luis Obispo and Ventura counties, according to Cal Fire officials. No dooryard burning is permitted until the close of fire season. However, agricultural burning with a valid burning permit is now allowed, according to Cal Fire. A Carmel man was convicted and sentenced to more than 10 years in prison Friday for setting a series of arson fires on Jacks Peak in 2006 and 2007. Scott's defense attorney, Richard Rosen, said he will appeal his client's conviction because the judge did not allow the jury to hear evidence that two other men were caught trying to set a similar fire on Jacks Peak six days after Scott was arrested. A jury also convicted Lance Oliver Scott, 39, of marijuana cultivation at his trial last month. He was arrested Aug. 12, 2007, after Cal Fire investigators placed a global-positioning device on his car and pin-pointed him at the scene of one of the fires. The Forest Service has released its approved report on the impacts of the Basin Complex and Indians Fires and what steps will be taken on Los Padres National Forest lands to help minimize impacts over the winter. The "Burned Area Emergency Response (BAER) Assessment" describes the effects of the fires on the land, post-fire threats of concern such as flooding and debris flows, and the emergency treatments planned for National Forest lands to address these threats. The Forest will receive slightly over $1 million in emergency funding to implement the treatments. BAER is a Forest Service program with the goal of protecting life, property, water quality and deteriorated ecosystems from further damage from flooding and other natural events after a fire. A Forest Service BAER Team was convened in August to assess the entire burn area. Members included specialists in hydrology, soil science, geology, biology, botany, archaeology and engineering. The Team coordinated with local, state and other federal agencies to discuss assessment findings, values at risk and treatment options. Improve culverts and water crossings on selected National Forest lands to improve water flow and reduce flooding and erosion. Do safety treatments on selected National Forest trails to reduce erosion. Coordinate with Caltrans on the installation of debris catchment structures. Conduct woody debris detection surveys at specific locations upstream of key Highway 1 road crossings and other structures at risk. Permit the National Weather Service to place instruments on National Forest lands. Install signs warning forest visitors of hazards such as falling trees, rock slides and flash flooding at critical areas, closed areas and archeological sites. Conduct noxious weed detection surveys to minimize damage to the watershed. Coordinate with local and other agencies in the implementation of treatments and emergency preparedness. 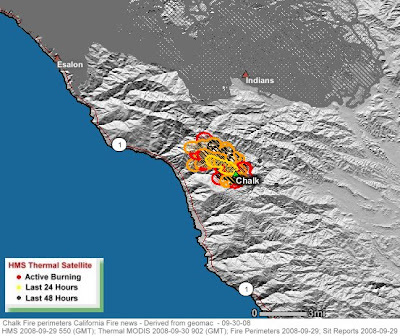 The Basin/Indians Fire BAER report is available in the "Current Conditions" section of the Los Padres National Forest website at http://www.fs.fed.us/r5/lospadres/conditions. The Basin and Indians Fires combined burned approximately 240,000 acres in Monterey County of which 198,000 acres (83%) is National Forest land and the remainder is private or non-federal public land. The Forest Service has authority only to treat National Forest land. Local and state agencies and the USDA Natural Resources Conservation Service will address emergency treatment needs on private and non-federal public lands. Karl Kolodzik, a fire fighter with Cal Fire in the Riverside Unit, has a two year old daughter named Kennedy that was recently diagnosed with leukemia. She is currently being treated at San Diego Children's Hospital and requires blood transfusions. Please keep the Kolodzik family in your thoughts and prayers and consider donating blood. Kennedy is O+, but the San Diego Blood Bank will take any donation in her name. If donating please give patient code "KK04". The emergency medical service will see improved reforms and the creation of a statewide EMT registry, thanks to CPF-sponsored landmark legislation, which was signed this week by Governor Arnold Schwarzenegger. • Mandatory background checks prior to certification or re-certification: Everyone with an EMT certificate will ultimately be subject to a background check. • A statewide central EMT and paramedic registry: Employers can check whether a prospect has had a background check, a criminal history or has had past action against their certification or license. • EMTs will have to be certified in the county in which they work, eliminating "county hopping" by EMTs. - Abuse of alcohol and any conviction involving alcohol or drug use. - Falsifying records related to controlled substances. • Requires that employers report all disciplinary plans to local EMS agency with specific recommendations on certification. AB 2917 was double joined to Senate Bill 997 so the Governor needed to sign both to insure passage of either. • Defines an Advanced Emergency Medical Technician or Advance EMT as someone who has additional training in limited advanced life support. • Adds two additional gubernatorial appointees on the EMS Commission who are selected from a list of names submitted by the California Professional Firefighters. One appointee would be employed by the California Department of Forestry and Fire Protection (Cal FIRE) and the other would be employed by local government. As such, SB 997 provides additional, appropriate firefighter/paramedic voices on the EMS Commission - one representing state interests and one representing local interests. "We've been working for a long time to achieve this. It's a huge victory for CPF and EMTs across the state," said CPF Secretary-Treasurer Lew Stone, who serves on the EMS Commission. "This bill will properly place disciplinary issues where they belong- between the employer, the PM/EMT, and their union representative. Double jeopardy will no longer be hanging over our members' heads." When: This Prescribed Fire is scheduled to begin Tuesday, September 30, 2008. On September 30, 2008. Location: Mariposa Grove of the Giant Sequoias is located in the Wawona area of the Park and near the southern entrance gate, in Mariposa County. Size: Approximately 90 acres are planned to be burned. Ignition is expected to last one to two days. Fire information Officers and Interpretive Rangers will be present daily to answer visitor questions. Fuels: Parts of each of these units have been burned in the past and are comprised primarily of White Fir and other mixed conifers. Closures: No trail closures are anticipated. Daily tram tours and access to the Grizzly Giant will continue. Air quality: Visitors will experience diminished air quality due to smoke accumulations. However, the burn is planned during ideal atmospheric conditions to mix and lift the smoke out of the area, Park fire managers will monitor smoke on a consistent basis. People with respiratory problems should use caution when exerting themselves in smoky areas. Why Prescribed fire: Fire has a natural role in maintaining healthy ecosystems in Yosemite. Decades of fire suppression have altered the park’s natural fire regime. The forests have become dense continuous stands of shrubs and trees increasing the risk of uncontrollable Wildland fires. Prescribed fire is designed to thin forests and reduce unnatural fuel loads in areas that are in close proximity to visitor use areas as well as public and private structures. Fire produces the optimum conditions for Giant Sequoia reproduction and propagation. Fires not only removes the accumulated layers of dead woody debris exposing nutrient rich mineral soil, but dries the cones allowing the seeds to shed. Fire also creates holes in the forest canopy while eliminating shade tolerant competition. This report will be updated Monday - Friday. Initial attack activity was light across the nation. New large fires were reported in Kentucky and Oregon. NEW Roblar (Camp Pendleton, Department of Defense): 400 acres at 40 percent contained. This fire is eight miles west of Fallbrook. Hidden (Sequoia and Kings Canyon National Park): 2,954 acres at 90 percent contained. Reduction in acreage is due to more accurate mapping. Klamath Complex (Klamath National Forest): 192,038 acres at 90 percent contained. The complex is 14 miles west of Etna. Active fire behavior was reported. NEW Brushy (Daniel Boone National Forest): This fire was contained at 265 acres. NEW Wizard (Deschutes National Forest): 200 acres at five percent contained. This fire is 18 miles northwest of Sisters. Kitson (Willamette National Forest): 1,000 acres at 45 percent contained. This fire is seven miles southeast of Oakridge. Horseshoe (Deschutes National Forest): 415 acres at 60 percent contained. This fire is 25 miles southeast of Lapine. Active fire behavior was observed. Gnarl Ridge (Mt Hood National Forest): 3,280 acres at 38 percent contained. This previously reported incident is 10 miles south of Parkdale. Structures are threatened. Rattle (Umpqua National Forest): 18,039 acres at 60 percent contained. This fire is 30 miles east of Glide. Structures are threatened. Area closures are in effect. Lonesome Complex (Rogue River National Forest): 19,361 acres at 35 percent contained. This complex of three fires is 20 miles northeast of Prospect. Historical structures are threatened. Big Cove (Prineville District, Bureau of Land Management): This fire was contained at 4,779 acres. After racking up a dozen citations for crossing the Dumbarton Bridge without paying tolls after fighting fires or attending business meetings, the Menlo Park Fire Protection District is waging a campaign for automatic free passage. But officials from the Bay Area Toll Authority are treating the district's complaints like much ado about nothing. Chief Harold Schapelhouman says his fire district has received 12 citations so far this year for driving through the bridge's FasTrak gate. Whether it was a fire truck that helped fight an East Bay blaze, a battalion chief returning from an emergency call, a semi-truck that transported search-and-rescue gear or just a fire official coming back from a business meeting in a Ford Taurus, the citations ran from $29 to $31, depending on the number of axles. True, that isn't a big financial drain. And yes, the fire district successfully contested many of the tickets. But that's not the point, Schapelhouman said. Dealing with the citations takes time because of paperwork and phone calls, Schapelhouman said. And the principle of emergency responders from the west side of the Dumbarton Bridge having to pay tolls after making mutual-aid runs, let alone pay citations, is wrong. "We're not charging for our emergency services," Schapelhouman said. Officials with the toll authority, which manages FasTrak and tolls on the Bay's seven bridges, say there are no viable alternatives. Unless a public employee is on an emergency call, they have to pay tolls like anyone else, said authority spokesman Randy Rentschler. "Where do you draw the line?" Rentschler asked. "This is the only way to do it. If there's an issue with a citation, you have to let us know and we'll take care of it."